Wine credenzas are furniture-style wine storage units equipped with a cooling system. If you don’t have a cellar or other proper, air-conditioned place for storing your wines then a wine cellar credenza might be a good option if you look for not only practicality but attractiveness in a wine storage appliance. These console type temperature controlled wood wine cabinets, often referred to as wine credenzas, are available in a wide range of decors regarding wood type and finish. The best-known manufacturers that make top quality wine credenzas are Le Cache, Vinotheque, and Vinotemp. What To Consider When Buying a Wine Credenza? Storage Capacity – always buy twice the size that you think you need at present – when you have a good wine storage unit you’ll tend to buy wine at every opportunity and you’ll fill up the wine refrigerator/credenza in no time. Always inquire about the total number of bottles that can be stored individually racked. In case of larger wine credenzas the total storage capacity includes both bulk storage (bottles are stacked upon each other) and racked bottles. Cooling System – a good-quality low-noise cooling unit. Space in Your Home – make sure you have sufficient space for placing the wine credenza and have enough clearance around the sides and at the back for proper venting. Wine credenzas are usually no more than 42 ” high and max. 80 ” wide. Number of Temperature Zones – if you want your wine cabinet to have the flexibility of being able to chill whites in one of the compartments and keep reds at 55 °F then you should choose a dual temperature zone wine storage credenza. There are also triple zone wine cabinets with a large compartment for long term storage and two smaller zones for chilling whites and warming up reds to serving temperature. Read more about 2-Zone Home wine Storage Units. Humidity Control – The ideal humidity inside a wine credenza and in other home wine storage appliances is around 70% but anything in the range of 50-70% is acceptable. Some wine cooler manufacturers (EuroCave) integrate sophisticated humidity control systems in their units maintaining constant humidity level inside the wine storage unit. Eurocave stands out regarding humidity control because its units not only display current humidity but have an alarm feature warning the owner in case the humidity level is out of the normal range. Customization Options – what customizations options are offered by the manufacturer? Can you choose the wood finish color? What sort of racking options are available? Noise – if you plan to place the credenza in the living room where you spend most of your time then pay extra attention on how noisy is the unit you plan to buy. 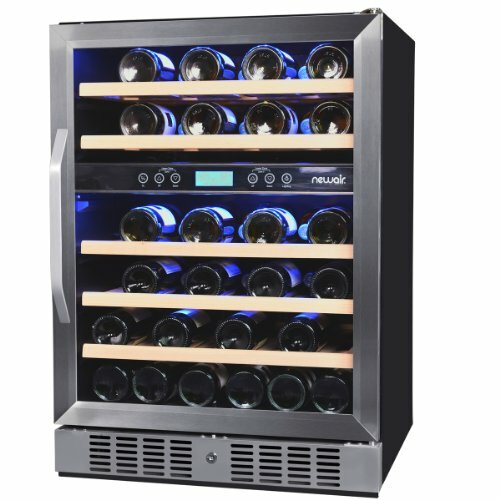 Wine storage cabinets with thermoelectric cooling system are usually less loud than compressor-operated wine cabinets. See also our guide to buying wine cooler refrigerators and our Wine Storage FAQ page. Le Cache makes premium quality furniture style wine storage cabinets for long term storage and aging of wines. It started manufacturing and selling wine cabinets in 1991 so it has considerable experience in the field of making reliable home wine storage units. Apart from a wide range of other wine cabinets Le Cache offers 3 series of wine credenzas. 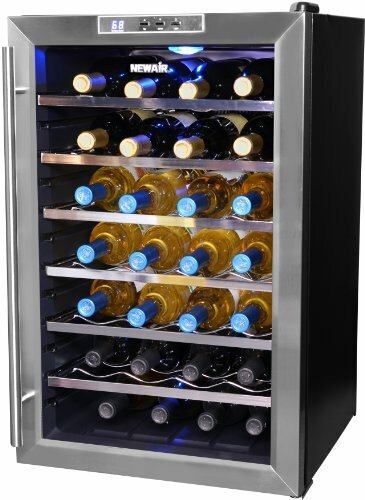 All Le Cache wine cabinets are equipped with a high-performance cooling unit the CellarPro Cooling System. It has digital temperature control and display, as well as automatic defrost to prevent ice build-up. Additional feature is the adjustable humidity level up to 70 % relative humidity. The cooling unit is integrated in the cabinet and has powder-coated dark grey finish so it blends in the cabinet interior. 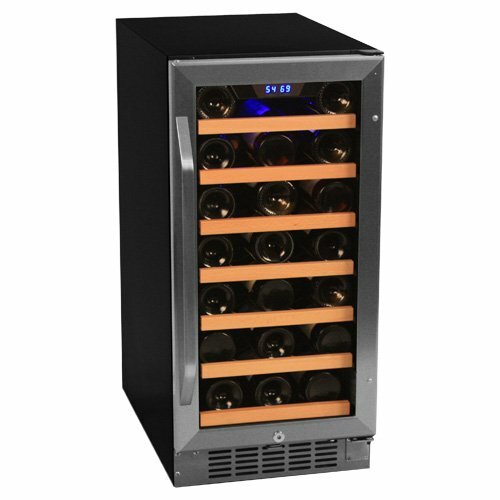 Le Cache wine storage cabinets use the so-called forced-air cooling system (just like most other wine cabinet makers) which means that the cabinet contains a separate, self-contained air-conditioner the cooling unit. This cooling technology is capable of cooling 30-40 °F below ambient temperature and it can’t heat so the cabinets cannot be placed in extreme cold or hot environment. 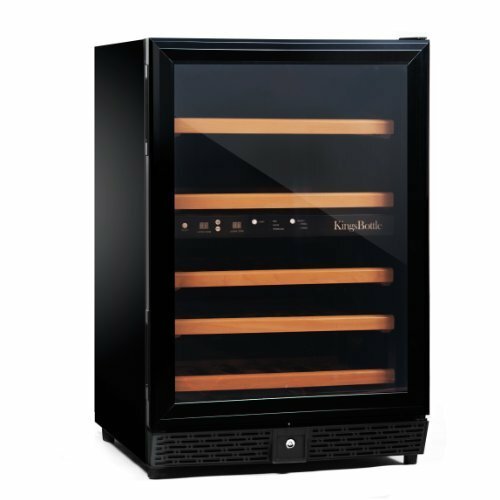 You can order your wine cabinet with an upgraded, more powerful cooling unit the CellarPro 1800-XT for extreme ambient temperatures (note that the drawback of the extra cooling power is more noise -cc. 10 dB more, for comparison the normal cooling unit generates around 50 dB). You can also opt for all-hard wood door and extra insulation but if you live in an extra cold or hold climate then you’d be better off with a wine storage cabinet that has cold-wall cooling system like EuroCave or Transtherm. Le Cache wine credenzas carry 5-year warranty on the cooling unit and 2-year warranty on the entire cabinet. If your wine credenza’s cooling unit breaks down Le Cache will send you a replacement unit. You can return the faulty unit to them for repair after you received and installed the new one. Shipping costs to and fro the manufacturer are paid by the owner. Le Cache also has a 30-day return policy (“If you purchase your wine cabinet from Le Cache and you are not completely satisfied with your purchase, you may return it within 30 days for an exchange, refund or credit.” from Le Cache’s website). Another benefit of Le Cache wine credenzas and cabinets is that the manufacturer guarantees to ship it to you within 3-5 days of purchase (at other companies shipping takes several weeks). Allow 3-4 inches clearance at the back for proper ventilation of the cooling unit. Leave also cc. 8-9″ at the top of the unit for adequate access during the maintenance of the cooling system (cleaning the condenser coils occasionally). The cooling unit plugs into a standard power outlet and it draws 3 Amps. The length of the cord from the back of the cabinet is 6 1/2″. Because of the considerable weight of the credenza – especially when loaded – place it on a sturdy hard surface otherwise the cabinet may become skewed if the doors settle unevenly. If you plan to place the cabinet on a carpet flooring, place a carpet board underneath the cabinet so it won’t leave marks on the carpet. The 3 -door wine credenza has premium cherry wood veneer and hardwood doors with dual pane tinted door glasses. Universal wood racking with 3 3/4″ wide opening – it accommodates oversized (long and wide) bottles (Burgundy, Pinot Noir and many Champagne bottles) and has space for 180 bottles (150 racked, 30 bulk storage). The bulk storage space is at the top of the rack where wines for long term storage are recommended to be placed. The racking system is one of the major strengths of Le Cache wine credenzas since the opening is larger than that of standard racking (3 1/4″) and it fits odd-sized bottles which have become very widespread recently. The racking is made of cherry wood and it has double-sealed finish. It shows that a lot of attention was paid to every detail: precision fits, eased edges, tapered ends. Wood racking is more beneficial for storing wine because metal racks tend to bend under a lot of weight and it can also scratch the bottle and the label. Power consumption: electricity consumption of a wine cabinet depends on several factors such as ambient temperature, adequate ventilation, load etc. These factors determine for how long the cooling unit runs in an hour to maintain the set temperature (e.g if it runs 30 minutes/hour then the approx. consumption is around 100 kWh). Price of the Le Cache Euro Credenza: cc. US$ 3900 – 4000 (US$ 21.66 – 22.22 per bottle). The Mission series wine credenzas were created by the famous Bay-area furniture designer Berkeley Mills. The beautiful modern wine cabinets feature hand-painted cherry wood veneers cover the insulated paneled walls. Engineered wood mullions, ebony accents, pewter pulls lend elegant look to this great piece of furniture. The hardwood triple doors contain double pane and UV-tinted door glass. Similarly to the European series the Mission Wine credenza also fits 180 bottles of wine (150 racked and 30 bulk storage) on the same unique universal cherry wood racking. The cooling unit is also the same CellarPro. Price of the Le Cache Mission Wine Credenza: cc. US$ 3500 – 4000. Read a full review on the Le Cache Contemporary Series Credenza Wine Cabinet. WhisperKool cooling unit – this is the standard self-contained air-conditioning system – a box mounted inside the cabinet. The WK cooling unit is available in two sizes: 1200 BTU model for cabinets to be used within normal climate conditions, and the 2300 BTU model for extreme climate. Read more details about the cooling system of Vinotheque wine cabinets. 3 or 4 door models are offered in the Franciscan series of wine credenzas with either single (24″) or double depth (39″). The Vinotheque Franciscan Series wine credenza can be ordered either with QT cooling system which gradually cools the interior of the cabinet from rear to front, or with a WhisperKOOL cooling unit. The unit is designed to cool to a min. temperature of 50°F. All Vinotheque wine cellars contain the advanced PDT™ Thermostat with Liquid Measuring Probe; a precision digital technology to measure liquid temperature. Self-calibrating probe with a sensor chip which communicates back and forth the thermostat for precise temperature adjustment and consistency. Built-in defrost cycle – the cooling unit shuts off for 5 minutes in every 90 minutes to prevent frost build-up. Heavy-duty circuitry – the new advanced circuitry resists sudden power surges which could damage electrical components, this ensures trouble-free operation of the cooling system. The manufacturer recommends the owner to install surge protector for maximum protection. Fahrenheit or Celsius Display – you can set the unit to display temperature either in either °F or in °C. By measuring liquid temperature instead of air temperature the thermostat ensures more stable and accurate temperature of the wine and causes the cooling unit to cycle less frequently. The space for bulk storage is located at the top and it’s 8 inches wide. The wood racking, which is 3 3/4″ wide, accommodates a wide range of bottles including 750 ml ones and most Champagne bottles. The wood exterior is available in two types (alder or red oak) and offers the option for upgrading it to exotic wood or granite inlays (maple, black walnut, cherry, mahogany). Stain options are: natural, light, medium, dark or limed (very light, beige color). You can order you wine cabinet with windowed door or solid door. Interior light and lock and key set is included. The Franciscan series wine cabinets don’t come with interior light because the light fixture would take away from the storage space. There are no controls on the QT cooling system since the low height of the cabinet temperature will not vary significantly between the top and the bottom thus the fan and control switches have been removed. The Condensate Evaporator turns on whenever the cooling unit is running. Placement: ambient temperature is important because the cooling unit is able to cool 30°F below ambient temp. so place the wine credenza in a room where the temperature won’t exceed 85°F otherwise the unit won’t be able to maintain 55°F within the cabinet. Take into account that the weight of the cabinet will be significant when loaded so make sure the floor where you plan to put the credenza is sturdy enough to hold that much weight. Leave enough space around the sides (6″), the back (2-3″), and at the top (at least 12″) for adequate ventilation: the compressor gives off heat during operation which has to be dissipated properly, outside the cabinet. If the heat accumulates around the cabinet the cooling unit won’t be able to operate and cool efficiently. Noise: The QT cooling unit is quieter than the WhisperKOOl. Note that after loading the credenza and starting it the cooling unit will run continually until it has reached the set temperature. Afterwards the cooling turns on only when it’s necessary to maintain the temperature. The amount of time the cooling system needs to turn on depends on the ambient temperature. Humidity: Unlike Le Cache wine cabinets Vinotheque’s units doesn’t have adjustable humidity control. The cabinets are designed to maintain 40-70% relative humidity inside the unit. If you live in a very dry climate place a sponge in a small container of water at the bottom of the cabinet to increase humidity. Price of Vinotheque Franciscan Series wine credenzas: 3-door unit is available for cc. US$ 5000 – 5500, the 4-door model sells for around US$ 5200 – 6000. Warranty: Vinotheque wine credenzas come with 5 year warranty on the compressor (Le Cache’s warranty covers the entire cooling system). Shipping: a couple of weeks. The Vinotheque Villa series wine cabinets also include several credenza-style units (Riviera, Milan, Madrid, Seville, Barcelona). These models come with WhisperKOOL cooling unit and have metal racking. AmeriCave is made by Wine Cellar Impressions based in San Jose, USA. Besides a wide selection of upright cabinets AmeriCave offers credenza style wine storage units in various sizes (2-door, 3-door, 4-door, 5-door and 6-door). These elegant cabinets were designed for aging of wine. Regarding capacity the smallest model is a 58-bottle Petite 2-door model while the larger models can hold around 400-430 bottles of wine racked and in bulk storage. Warranty: 5-year on entire cooling system 3 years on cabinetry. Optional Angle Racking – available for standard configuration only the rows hold the bottles at 15 ° angle to display the labels on the bottles. Choice of 1-4 rows of angle display is available. The cooling unit vents at the back, required clearances: at least 3″ from wall at the back, min. 18″ at the top. Price: a 2-door Credenza by AmeriCave start from cc. US$ 1700-1900, a 3-door unit costs cc. US$ 2000-2400, a 5-door model is around US$ 2800-3000, while a 6-door credenza sells for cc. US$ 3300-3500. TIP: see other home wine storage options for aging wine. Vinotemp has several stylish wood wine credenzas in their Portofino series which are equipped with hybrid cooling system (a combination of thermoelectric and traditional compressor cooling with environmentally-friendly cooling agent: R 134) which is said to be energy efficient and fairly silent. What I like about Vinotemp Portofino Series wine cabinets is the refreshingly new design that lends an understated elegance to its units. Hamilton 2-Door Wine Credenza – stores up to 40 bottles, black stained hardwood exterior, 2 doors with dual pane glass window and stainless steel knob pulls, mechanical temp. control knob in each zone, 5-5 scalloped, slide-out wire racks (each holds 4 bottles), Dimensions: H: 32 3/4″, W: 42 3/8″, D: 22″, price: cc. US$1300. 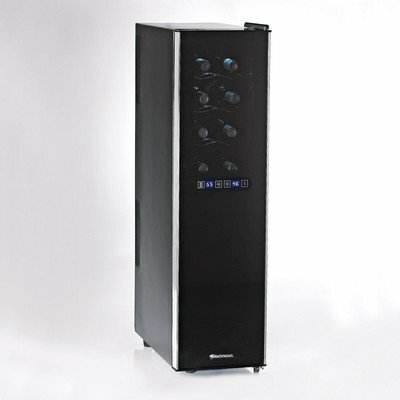 Wine Mate 1500CD self-contained (forced-air) cooling system which contains eco-friendly R-134 coolant. Cavavin, a Canadian manufacturer of wine coolers /wine cabinets offers nice credenza style cabinets for wine storage. Bottle capacity ranges from 33 bottles to 203 bottles with 38″ or 44″ height. There are also double credenzas with bottle counts ranging from 66 bottles to 406 bottles. Although Vinotheque also offers exceptional quality wine credenzas and cabinets but they’re more expensive than Le Cache. AmeriCave is more affordable but several features that are standard at the other two manufacturers are available for extra charge.